• Features built-in Connext® wireless technology for flight plan transfer and more with select Garmin portables and mobile device apps such as Garmin Pilot™ Designed from the ground up with a native touchscreen interface, G3X Touch flight displays are the smartest, most advanced large-format flight displays we've ever designed (and priced) specifically for experimental/amateur-built aircraft. 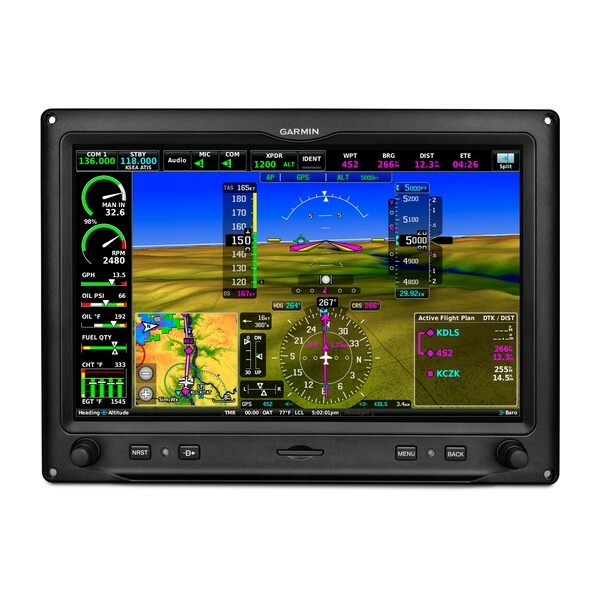 And the integration and versatility provided by G3X Touch make it easy to create the ideal panel layout for your airplane. It's all enough to make you want to build one — just to have a platform for these amazing displays. Built for Your Needs, Panel and Budget The G3X Touch suite of displays offers incredible installation flexibility. Use any combination of up to 4 of the 10.6" and 7" landscape or 7" portrait displays. These bright, easy-to-read screens are easily configured as PFDs for attitude, airspeed, altitude, heading, vertical speed and more, MFDs with advanced moving map, including terrain, obstacle and traffic alerts, georeferenced FliteCharts® or Jeppesen® ChartView™ charts and SafeTaxi® airport diagrams, or optional EIS. Each display features a high-resolution screen with infrared touchscreen technology that offers large touchpoints to ensure precise inputs and minimize inadvertent touches, even with gloves. And there's a handy bezel to steady your hand in rough air. Of course, G3X Touch also has 2 familiar concentric knobs and 4 dedicated buttons — for quick access for Nearest, Direct-to, Menu and Back — if that suits your style, too. Configurable Touchscreen Display Infrared touchscreen technology puts all of your flight information at your fingertips. Easily pan across the moving map by dragging your finger across the screen, or pinch to zoom to see more detail. Switch from full-screen PFD to split PFD/MFD with a touch. And if your installation includes a separate PFD and MFD, you'll have reversionary backup should a failure of either display occur. In reversionary mode, the remaining G3X Touch display combines critical flight instrumentation with engine readouts and navigation information in a single-screen consolidated presentation, making this situation a virtual nonevent. Also, G3X Touch can display engine information with the addition of a GEA™ 24 module. This user-configurable EIS enables aircraft-specific tailoring of displays for engine gauges, color bands, alerts, fuel, flaps, trim and other vital sensor data. Engine sensor kits are available for most popular engine configurations used in experimental/amateur-built aircraft, or you can manually configure gauges with any electrically compatible sensor (see installation manual for details). A single GEA 24 can support piston engines of up to 6 cylinders and turbine applications, while a second GEA 24 allows you to monitor engine operation for up to 12 cylinders, including radials and twin-engine applications. It even works with CAN bus interfaces for compatible FADEC engines such as the Rotax 912 iS. ?